As I watched Chris Rock's monologue on SNL I did laugh in between picking my jaw off the ground. 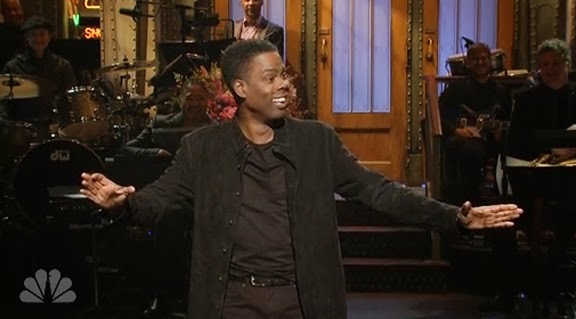 Once again Chris Rock has proven he has the biggest balls in comedy by touching on some sensitive subjects such as terrorism, the "eventual" commercialization of 911 and those gun nuts out their who personally threatened him. One can argue that his comments may of been insensitive but one thing that is being said but should not be is that he was making fun of 911, making fun of the tragedy of the Boston Marathon bombing. He was clearly not. What his comments did do was to walk that fine tightrope between comedy and social / political commentary and while it might of made us feel uneasy at times, this kind of discourse in the comedy realm is needed. It was what George Carlin did so very well. Was Rock's monologue offensive? That answer, of course, is a subjective one but (to me) no more so than the countless number of TV shows that have used terrorism as a backdrop for their dramatic content. Obviously, events in the world are going to shape TV and what TV writers write about but all too often the events of 911 and terrorism have been injected in shows like 24, Rescue Me, Sleeper Cell and more as an easy emotional cue or dramatic punchline. In this respect, terrorism and 911 was "commercialized" a long time ago as tragic events and the dramatization of those events get ratings and ratings sell soap. There are not a a lot of high profile comedians today who make you laugh and think about the world at large or the human condition. The two that immediately come to mind are Louie CK and Chris Rock. When watching a comic I would much rather chuckle and think than laugh till I cry.